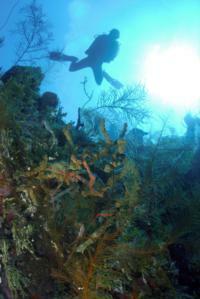 I just came back from a trip to the Bahamas (Nassau, Stuart Cove’s dive operation) booked through PADI travel. What started as a group of two couples turned out to be four couples of divers: KevinD and Carmen, Jason and Melissa, Carl and Maggie and Nathalie and myself, all from Sterling Silver Scuba in Northern Virginia. We landed as planned at Nassau International on Wed at 12h30pm and headed for our hotel, Orange Hill Inn on the west side of New Providence Island. As soon as we checked-in, a group of three (Jason, Carl and Maggie) went scouting the dive operation and went for a 2-tank boat dives. Kevin, Carmen, Melissa, Nathalie and I decided to take it easy, have lunch and visit the area around the hotel. We went snorkeling and saw several star fish, juveniles, a baraccuda and sea cucumbers. It’s a sunny day in the mid 90’s and the water temperature is 81F. After showering, we went for a walk on the beach and had local food at the Traveler’s Lodge (20 mins walk on the beach North from the hotel). I’m thrilled, this is the first dive of the trip. This is a pretty impressive wall going straight down to 6500 ft deep into the abyss. Since the dive is pretty short, I decided to stay about 10 mins at 100ft or below to consume some of my air... after all, the plan is for a 35 mins dive, so no need to think about saving air... After 20 mins or so, I ascended to 40 ft to return to the boat. At 35 mins, the dive was called and we went for our safety stop.... On the second dive, we visited Mike’s reef. Uneventful dive, nothing special to report. I managed to get a spot on the shark dive boat in the afternoon with Carl and Maggie. I buddied with Aaron who I met in the morning. The first dive was to get familiar with the shark arena and check buoyancy. The scariest part was to jump in the water when you see all the sharks hanging out near the boat... Once in, I descended to the arena and waited for the others so we could go dive the Shark Arena North Wall. It is a pretty nice wall, not much current and lots of coral and some fish. While everybody was checking their buoyancy, I was looking for shark teeth and found a sea horse... I was pretty happy with my encounter... On the second dive, I added 4 pounds to make sure I was really negatively buoyant... and kneeled at the circle of the arena. To my left were Carl and Maggie, while Aaron was on my right hand side. There were lots of carribean reef sharks (25+) ranging from 6 to 10 feet or so. They were not interested in the divers at all, but enjoyed the red snappers... Once the shark feed was over, the divers approached the center of the arena to look for shark teeth. I found three small ones (1/2 inch) and a fish hook. The dive operation doesn’t do regular night dives unless there is a group of 6 or more who ask for it. We were 8; so we managed to schedule one. We went to the Willlaurie wreck. Nice boat that was used in a movie just recently. The max duration was 45 mins. The divemaster did not dive with us. It was my first ocean night dive without a divemaster. Each buddy team went their own way. I stayed with Nathalie and we dove around the wreck until we decided to go farther for some more adventure. We saw several criters: lobsters, large crabs, huge puffer fish and baby ones, sea cucumbers, sea urchins, lots of lion fish and bio luminescent organisms. We managed to get lost and find our way back to the boat as our time was running out. Decent night dive, but I was hoping for more marine life. Great wall with lots of coral and algea growing on it (reminds me of Honduras, but the reefs in Utila were in worst shape); few fish. The coral reefs are in bad shape. Is it due to the lion fish eating all the small fish? Tourism/Pollution? On the second dive, we revisited the Willaurie that we dove the previous night. It was fun to visit both wrecks since we could not find the Royal James the night before. Also, the lighting, holes in the wreck and skeletons left from the Bollywood movie created interesting underwater scenes. Saw a yellow stingray, the usual lion fish and a couple of spotted moray eels. This afternoon, Nathalie joined me for the shark adventure. Jason, Melissa, Carl and Maggie also joined. Kevin decided not to come since it goes against his belief to feed the wildlife and change its natural behavior. On the first dive, we opted not to follow the group on the North Wall and went to visit two nearby wrecks: Bahamas Mama and Ray of Hope. The current was pretty strong but we managed to make it to the wrecks. The Bahamas Mama was of decent size 40-50ft, on its side. Lots of lion fish, school of grunts, and sharks around. 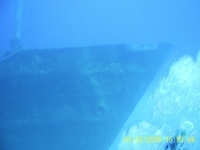 The Ray of Hope is a large wreck of about 180ft. As with the Bahamas Mama, there was a lot of marine life around. Nathalie and I decided to turn around earlier than the others due to current and visibility. Once we got back to the arena, I looked for the sea horse I had seen the day before, but it was not at the last location anymore. Nathalie found a couple of small shark teeth (1/2 in) and I found a large one (3/4 in). On the shark feeding dive, we went straight to the arena kneeling and waitied for the feeding. Jason and Melissa were on our left and Carl and Maggie to our right hand side. The feeding was ok, but not as impressive as the day before as there were less sharks and the feeder had some difficulty with a nurse shark who did not want to go away... Nathalie was breathtaken and it was a much more calming experience than anticipated when she realized that the sharks were absolutely not interested in her skinny bones... Ironically, it was my lowest SAC rate ever: 0.3 cuft/min/ATA - the prior day, I had 0.34 cuft/min/ATA; a little more excitment and I was anxious with all those sharks bumping into me. Interlude: We went to eat at the Traveler’s lodge for dinner. We closed the place and left around 10pm. We started walking back toward the hotel when an off duty bus came along. If you want a free bus ride at night, let Nathalie tag along; she knows how to get a ride.... I won’t eleborate.... as the saying goes, "what happens in the Bahamas stays in the Bahamas". Last two dives of the trip. For the first one, we went to Pumpkin Patch, a reef where orange coral grows. The current was pretty strong and we were drifting fast, kicking strong to stay near the wall. Nathalie was freaking a little. We almost had to abort midway since she was overexerting due to the strong current and kicking hard to stay near the wall. We decided to head back towards the boat and got closer to the bottom where the current was milder. She finally regained control and we managed to finish the dive after seeing some nice marine life and the orange corals. We also saw a couple of turtles, several pipe fish, lion fish and a spotted moray eel! As a side note, a slate would have been useful to communicate. Thanks for posting. It was very interesting to read especially since I have not been there yet. Nice write up.. I’ve been the Stuart Cove’s and had a good time. But, I have to agree with the cattle boat/short dive times comments... Still a good operation to dive with if you are in Nassau.. Thanks for sharing..
Nassau Bahamas Christmas week buddy up?